VigorACS 2 is a powerful centralised management software for Vigor Routers and VigorAPs, it is an integrated solution for configuring, monitoring, and maintenance of multiple Vigor devices from a single portal. VigorACS 2 is based on TR-069 standard, which is an application layer protocol that provides the secure communication between the server and CPEs, and allows Network Administrator to manage all the Vigor devices (CPEs) from anywhere on the Internet. VigorACS 2 Central Management is suitable for the enterprise customers with a large scale of DrayTek routers and APs, or the System Integrator who need to provide a real-time service for their customer’s DrayTek devices. From VigorACS SI to VigorACS 2, DrayTek makes an effort to create a user-friendly interface and integrates more devices configurations. VigorACS 2 is more capable of controlling and monitoring CPEs since it covers more TR-069 parameters than which were covered on VigorACS SI, AP Profile is also added to do VigorAP provisioning easier. VigorACS 2 adopts responsive UI, this allows you to operate VigorACS 2 via tablets or phones, and we re-arrange the space configuration of every page, hope to provide a better user experience. Provisioning allows Vigor devices, when connected to the VigorACS 2, to receive the pre-configured parameters automatically, and make the device set up without the need of an on-site technician. On VigorACS 2, provisioning can be done either per network group (Global Parameter), or per device ( CPE Set Parameters), you may also make a list of the parameters that should always apply to a certain device and thus to prevent unexpected configuration changes on it ( CPE Keep Parameters). VigorACS 2 is also an AP controller for managing and monitoring VigorAPs. You may pre-configure AP settings such as SSID, security, load balancing rules into an AP profile, and VigorACS 2 will automatically apply the settings to the new joined VigorAP. There is also an AP Map function that allows you to upload a floor plan and place APs on it, simulated wireless coverage are shown to help you find the best position of each AP. From VigorACS 2, you may check all the information of a CPE as if you were connecting to the device locally, including the uptime, firmware version, resource usage, client number…etc. 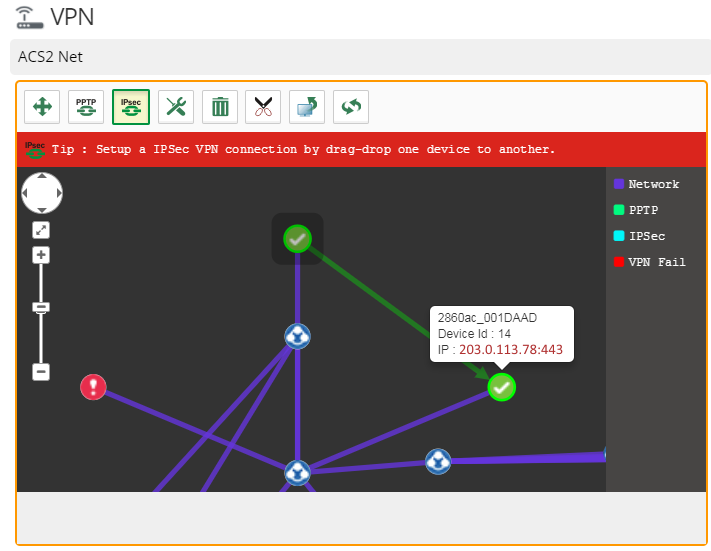 Furthermore, a connection loss on CPEs, including WAN, LAN, and VPN connections, will be highlighted on the dashboard, you may also set up VigorACS 2 to send notifications to Network Administrator under certain condition. VigorACS Log records the activities on each device, such as file download, reboot, parameter change, etc. From VigorACS, you can check what has been done to each device and when has it been done. Furthermore, reports can be generated from VigorACS, which covers the topic about Device Information, Traffic Statistics, Firmware Versions Overview, IP address of LAN and WAN. VigorACS 2 adopts Responsive Web Design, which means the user interface fits a variety of devices, such as PCs, tablets, this allows you to manage all the Vigor routers and Vigor APs anywhere, and not limited by the devices. VigorACS 2 reduces the time spent on maintaining all the devices across many locations, you can do all the devices maintenance task remotely from VigorACS 2, such as firmware upgrade, configuration backup & restore, and device reboot. On VigorACS 2, a firmware upgrade can be applied to a single device or a batch of devices, upgrade tasks can also be scheduled during non-business hours, configuration backup can be set up to perform periodically, and frequency could be every day or longer depending on the customer’s need. VigorACS 2 offers an easy method, VPN Wizard, to configure LAN-to-LAN tunnels between the managed CPEs. By simply drawing a line between two devices, the required configuration for setting up a VPN tunnel will be applied to both of them automatically and VPN can be established immediately. While VPN Wizard provides a very simple way to create VPN, there are also options to choose the type and encryption method of the VPN. You can create multiple user accounts to log in VigorACS 2 and assign different authorities for each account. There are 5 privilege levels on VigorACS, which are: System Administrator (the highest), Group Administrator, Administrator, Operator, and View Only Operator (the lowest). We can also group some of the user accounts and assign the management authority of certain devices (by network) to a user group.